Angelica (Archangelica officinalis, Hoffm.) is a biennial or perennial herb of the natural order Umbelliferae, so called from its supposed medicinal qualities. It is believed to be a native of Syria, from whence it has spread to many cool European climates, especially Lapland and the Alps, where it has become naturalized. Its roots are long, spindle-shaped, fleshy, and sometimes weigh three pounds; its stems stout, herbaceous, fluted, often more than 4 feet tall, and hollow; its leaves long-stalked, frequently 3 feet in length, reddish purple at the clasping bases, and composed, in the larger ones, of numerous small leaflets, in three principal groups, which are each subdivided into three lesser groups; its flowers yellowish or greenish, small and numerous, in large roundish umbels; its seeds pale yellow, membranous-edged, oblong flattened on one side, convex on the other, which is marked with three conspicuous ribs. Since the seeds lose their vitality rapidly, rarely being viable after the first year, they should be sown as soon as ripe in late summer or early autumn, or not later than the following spring after having been kept during the winter in a cold storeroom. The soil should be moderately rich, rather light, deep, well drained, but moist and well supplied with humus. It should be deeply prepared and kept loose and open as long as tools can be used among the plants, which may be left to care for themselves as soon as they shade the ground well. In the autumn, the seeds may be sown where the plants are to remain or preferably in a nursery bed, which usually does not need protection during the winter. In the spring a mild hotbed, a cold frame or a nursery bed in the garden may be used, according to the earliness of planting. Half an inch is deep enough to cover the seeds. The seedlings should be transplanted when still small for their first summers growth, a space of about 18 inches being allowed between them. In the autumn they should be removed to permanent quarters, the plants being set 3 feet apart. If well grown, the leaves may be cut for use during the summer after transplanting; the plants may not, however, produce seed until the following season. Unless seed is desired, the tops should be cut and destroyed at or before flowering time, because, if this be not done, the garden is apt to become overrun with angelica seedlings. After producing seed, the plants frequently die; but by cutting down the tops when the flower heads first appear, and thus preventing the formation of seed, the plants may continue for several years longer. angelica. Formerly the stems were blanched like celery and were very popular as a vegetable; now they are little used in the United States. The tender leaves are often boiled and eaten as a substitute for spinach. Less in America than in Europe, the seeds, which, like other parts of the plant, are aromatic and bitterish, are used for flavoring various beverages, cakes, and candies, especially "comfits." 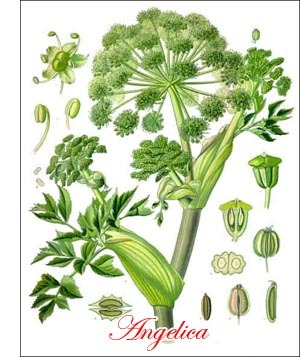 Oil of angelica is obtained from the seeds by distillation with steam or boiling water, the vapor being condensed and the oil separated by gravity. It is also obtained in smaller quantity from the roots, 200 pounds of which, it is said, yield only about one pound of the oil. Like the seeds, the oil is used for flavoring. Green says: The fresh roots, the tender stems, the leaf stalks and the midribs of the leaves make a pleasing aromatic candy. When fresh gathered the plant is rather too bitter for use. This flavor may be reduced by boiling. The parts should first be sliced lengthwise, to remove the pith. The length of time will depend somewhat upon the thickness of the pieces. A few minutes is usually sufficient. After removal and draining the pieces are put in a syrup of granulated sugar and boiled till full candy density is reached. The kettle is then removed from the fire and the contents allowed to cool. When almost cold the pieces are to be taken out and allowed to dry.